Imagine finding a body washed up on your shore. That’s exactly what happened to author, Jordan Blake, during an early Lake Effect snowstorm. So much for her quiet existence. Who was the handsome stranger? And why did he have such an effect on her? I normally say that the more detail I can get about a character, the better. This book, however, proved me wrong. Who would have thought that a man with no name and no history could be so incredibly attractive, or a single night spent with a stranger could be so memorable? With a great starting concept and a few deftly placed details, this story manages to pack a great amount of sizzle and sentiment into a much more compact form. STRANGER ON THE SHORE is one fast moving novel. From the beginning you will be caught up in all of the drama that unfolds in a fast pace right before your eyes. 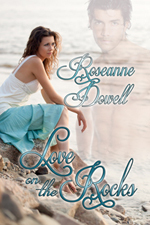 I was highly impressed with Roseanne Dowell’s writing style. She exhibits talents of a writer who knows how to write with a level of undertone suspense. I highly anticipate her next novel.